In this stage, use the drawing tools to create custom shaped planter beds for your project. Planter beds always follow the slope of the terrain. This is the stage where you will also create walkways and driveways. 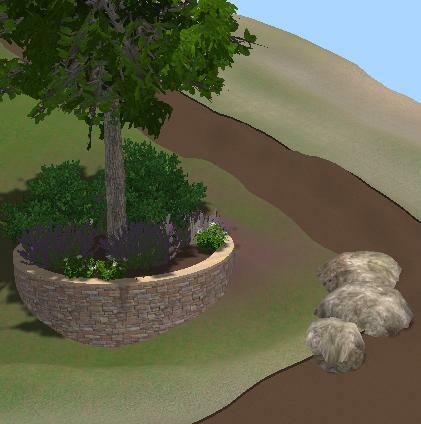 Terrain: Items drawn in the Planter Beds Stage will follow the slope of the terrain set in the Terrain Stage. This allows planter beds to be placed running up a hill or on a tree mound. This feature of planter beds also allows you to create elements such as driveways and walkways in your design. Planter Bed Location: If planter beds are not placed correctly they will not show up properly in 3D. It is very important that the line of the planter bed does not touch or cross the line of any other shape even other planter beds. This may cause the planter bed to show up incorrectly in 3D or not show up at all. A planter bed may be drawn inside another shape such as a hardscape or another planter bed, but the planter bed must be completely inside the larger shape, the lines of the two shapes may not touch. Raised Planters: Raised planters may be created by combining shapes drawn in the Hardscapes and Planter Beds stages. To create a raised planter you will start by first drawing a shape in the Hardscapes Stage. You will draw this hardscape shape with the dimensions of your raised planter and then sent the height for the raised planter under Stage Options. You will then go to the Planter Beds Stage and draw a planter bed shape inside the hardscape shape. You can use the Line and Arc tools or the Outline tool to draw this shape. You want to make sure the planter bed shape is completely inside the hardscape shape and the lines of the two shapes do not touch. Once your planter bed shape is complete you may set a depth under Parameters. This will set the depth the planter bed will cut into the raised hardscape. This method can be used to create raised planters, flower boxes, and other raised areas with cutouts. Depth: The depth box allows you to set the distance the planter bed will cut into the surface underneath it. This allows you to create objects like flower boxes and raised planters by combining raised hardscapes and planter beds. If you set a negative depth, the planter bed will rise up from the surface.